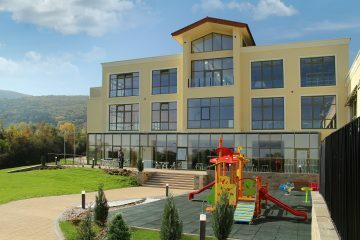 The American English Academy (AEA) is a private coeducational international school, established in 1992 in Sofia, Bulgaria. The new campus located in Lozen, Bulgaria opened on September 15th, 2014 for the 2014-2015 academic year. In cooperation with the Abraham Lincoln Private School, AEA offers an optional Dual Language Program which is designed for the specific educational needs of Bulgarian students in Grades 1-10. The program fully meets the requirements of the Bulgarian Ministry of Education. AEA has been part of Markan Holding since 2014. Sofia, Bulgaria Lozen Area, 1 Orlova Krusha Str.